1 A None No Power Seat 1 A is a First Class Bulkhead seat. The proximity of the lavatory may be bothersome. The Tray Table is in the armrest, making the armrest immovable and slightly reducing seat width. There is no floor storage for this seat during take-off and landing. 1 C None No Power Seat 1 C is a First Class Bulkhead seat. The proximity of the lavatory may be bothersome. The Tray Table is in the armrest, making the armrest immovable and slightly reducing seat width. There is no floor storage for this seat during take-off and landing. 1 D None No Power Seat 1 D is a First Class Bulkhead seat. The proximity of the lavatory may be bothersome. The Tray Table is in the armrest, making the armrest immovable and slightly reducing seat width. There is no floor storage for this seat during take-off and landing. 10 D None No Power Seat 10 D is a standard Economy Class seat that is missing a window. 11 A None No Power Seat 11 A is an Economy Class seat that is missing a window and also has no recline due to the exit row behind. 11 B None No Power Seat 11 B is an Economy Class seat that has no recline due to the exit row behind. 11 C None No Power Seat 11 C is an Economy Class seat that has no recline due to the exit row behind. 11 D None No Power Seat 11 D is an Economy Class seat that is missing a window and also has no recline due to the exit row behind. 12 A None No Power Seat 12 A has extra legroom due to the exit row in front but also has no recline due to the exit row behind. The tray table is in the armrest, making the armrest immovable and slightly reducing seat width. There is a misaligned window at this row. 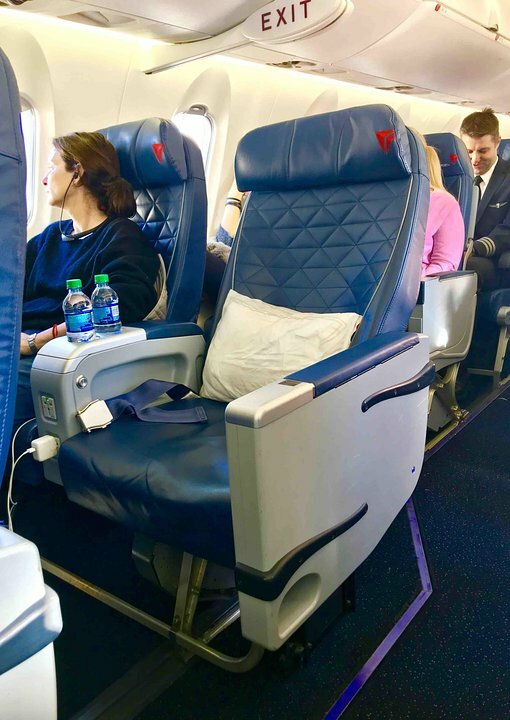 Delta designates this seat as a Preferred Seat, which is reserved for Delta Medallion members. This seat may be selected by Medallion members at time of booking or afterwards. This seat becomes available to all passengers at time of check-in. 12 B None No Power Seat 12 B has extra legroom due to the exit row in front but also has no recline due to the exit row behind. The tray table is in the armrest, making the armrest immovable and slightly reducing seat width. There is a misaligned window at this row. Delta designates this seat as a Preferred Seat, which is reserved for Delta Medallion members. This seat may be selected by Medallion members at time of booking or afterwards. This seat becomes available to all passengers at time of check-in. 12 C None No Power Seat 12 C has extra legroom due to the exit row in front but also has no recline due to the exit row behind. The tray table is in the armrest, making the armrest immovable and slightly reducing seat width. There is a misaligned window at this row. Delta designates this seat as a Preferred Seat, which is reserved for Delta Medallion members. This seat may be selected by Medallion members at time of booking or afterwards. This seat becomes available to all passengers at time of check-in. 12 D None No Power Seat 12 D has extra legroom due to the exit row in front but also has no recline due to the exit row behind. The tray table is in the armrest, making the armrest immovable and slightly reducing seat width. There is a misaligned window at this row. Delta designates this seat as a Preferred Seat, which is reserved for Delta Medallion members. This seat may be selected by Medallion members at time of booking or afterwards. This seat becomes available to all passengers at time of check-in. 13 A None No Power Seat 13 A has extra legroom due to the exit row in front. The tray table is in the armrest, making the armrest immovable and slightly reducing seat width. This seat is missing a window side armrest which may be bothersome. There is a misaligned window at this row. Delta designates this seat as a Preferred Seat, which is reserved for Delta Medallion members. This seat may be selected by Medallion members at time of booking or afterwards. This seat becomes available to all passengers at time of check-in. 13 B None No Power Seat 13 B has extra legroom due to the exit row in front. The tray table is in the armrest, making the armrest immovable and slightly reducing seat width. There is a misaligned window at this row. Delta designates this seat as a Preferred Seat, which is reserved for Delta Medallion members. This seat may be selected by Medallion members at time of booking or afterwards. This seat becomes available to all passengers at time of check-in. 13 C None No Power Seat 13 C has extra legroom due to the exit row in front. The tray table is in the armrest, making the armrest immovable and slightly reducing seat width. There is a misaligned window at this row. Delta designates this seat as a Preferred Seat, which is reserved for Delta Medallion members. This seat may be selected by Medallion members at time of booking or afterwards. This seat becomes available to all passengers at time of check-in. 13 D None No Power Seat 13 D has extra legroom due to the exit row in front. The tray table is in the armrest, making the armrest immovable and slightly reducing seat width. This seat is missing a window side armrest which may be bothersome. There is a misaligned window at this row. Delta designates this seat as a Preferred Seat, which is reserved for Delta Medallion members. This seat may be selected by Medallion members at time of booking or afterwards. This seat becomes available to all passengers at time of check-in. 14 A None No Power Seat 14 A is a standard Economy Class seat with a misaligned window. 14 D None No Power Seat 14 D is a standard Economy Class seat with a misaligned window. 2 A None No Power Seat 2 A is a standard First Class seat with a misaligned window. 2 D None No Power Seat 2 D is a standard First Class seat with a misaligned window. 20 A None No Power Seat 20 A is in the last row of the plane that is missing a window. The proximity of the lavatory may be bothersome. 20 B None No Power Seat 20 B is in the last row of the plane. The proximity of the lavatory may be bothersome. 20 C None No Power Seat 20 C is in the last row of the plane. The proximity of the lavatory may be bothersome. 20 D None No Power Seat 20 D is in the last row of the plane that is missing a window. The proximity of the lavatory may be bothersome. 3 A None No Power Seat 3 A is a standard First Class seat with a misaligned window. 3 D None No Power Seat 3 D is a standard First Class seat with a misaligned window. 5 A None No Power Seat 5 A is a standard Delta Comfort+ seat with extra legroom as there is no bulkhead in front however, this seat may have a misaligned window. The tray table is in the armrest, making the armrest immovable and slightly reducing seat width. 5 B None No Power Seat 5 B is a standard Delta Comfort+ seat with extra legroom, this seat is bumped into by other passengers and crew since it juts into the aisle. The tray table is in the armrest, making the armrest immovable and slightly reducing seat width. 5 C None No Power Seat 5 C is a standard Delta Comfort+ seat that has extra legroom due to the missing bulkhead in front. The tray table is in the armrest, making the armrest immovable and slightly reducing seat width. 5 D None No Power Seat 5 D is a standard Delta Comfort+ seat with extra legroom as there is no bulkhead in front however, this seat may have a misaligned window. The tray table is in the armrest, making the armrest immovable and slightly reducing seat width. 6 A None No Power Seat 6 A is a standard Delta Comfort+ seat that may have a misaligned window. 6 D None No Power Seat 6 D is a standard Delta Comfort+ seat that may have a misaligned window. 7 A None No Power Seat 7 A is a standard Delta Comfort+ seat that may have a misaligned window. 7 D None No Power Seat 7 D is a standard Delta Comfort+ seat that may have a misaligned window. 8 A None No Power Seat 8 A is a standard Delta Comfort+ seat that has a misaligned window. 8 B None No Power Seat 8 B is a standard Delta Comfort+ seat. 8 C None No Power Seat 8 C is a standard Delta Comfort+ seat. 8 D None No Power Seat 8 D is a standard Delta Comfort+ seat that has a misaligned window. 9 A None No Power Seat 9 A is a standard Delta Comfort+ seat that has a misaligned window. 9 B None No Power Seat 9 B is a standard Delta Comfort+ seat. 9 C None No Power Seat 9 C is a standard Delta Comfort+ seat. 9 D None No Power Seat 9 D is a standard Delta Comfort+ seat that has a misaligned window. Operated by SkyWest and Endeavor Air, this plane is used for Delta Connection flights and have a range of up to 2000 miles. This aircraft feels less cramped than many other regional jets but there is limited overhead storage room. On select CRJ-900s operated by Endeavor Air, all First Class seats have access to a 110v power port. Great seat, nice dirnks. Felt like I was flying in a lay-z-boy. Offset window was really not that bad. I still was able to see out. However, the seats were incredibly small. 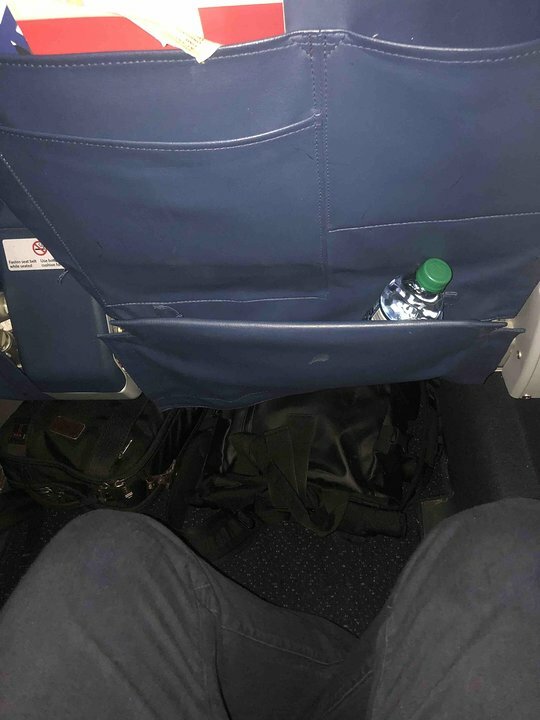 My 6'4" son with very broad shoulders was unable to sit without one leg in the aisle and the other into my seat area. The flight attendants were great but had to ask him to lean toward me when they came by with carts because his shoulders were wider than the seat and went into the aisle. So, getting an upgraded seat is a must if you're over 6' and have broad shoulders. This Comfort+ seat has more legroom than in first class seats on the same flight. There was a clear view out the window. My 6'4" husband could fully stretch his legs out with room to spare. Highly recommended! This review is seat 6D on N319PQ. Window alignment was poor (very far up), but the seat was not bad at all. AC power was available throughout First Class and Comfort+. Solid seat for a CRJ-900. CRJ 900 (9E). The 2 exit rows have fixed armrest with fold away trays. Great seat with a lot of room. Only row in first class that has the window s aligned properly with your seat. Good FC solo seat. Note that the port side FC section has a smaller overhead storage area than the starboard side. Port has sliding doors. You can stuff a windbreaker or purse in there but not much else. Small rollaboards fit in the bins to starboard. This an exit row seat -- plenty of leg room, but it does not recline. The problem is with the CRJ-900. It is long and thin. I could not, at 6 feet two inches, stand erect without bumping my head. If you are in the least bit claustrophobic, avoid this plane. These seats are emergency exit seats. As a result they have almost double the leg room. The also recline. The windows are slightly misaligned. One window is right next to chair so you see half and the passenger behind you sees the other half. The second window is very far up but can be viewed if you lean forward. None of the windows have shades to pull down. The trays are locked into the chairs so instead there are smaller trays that come out of the right arm rest. They are slightly smaller and closer to you as a result. These seats are also right on the wing which results in less turbulence. Rows 12 and 13 are probably the best seats in economy class; with row 12 being slightly better since there is more room behind you allowing you to recline all the way without bothering the people behind you. Being a regional aircraft all seats aft of Delta Comfort are cramped. This seat has a misaligned window which you would have to lean forward to look directly out of. 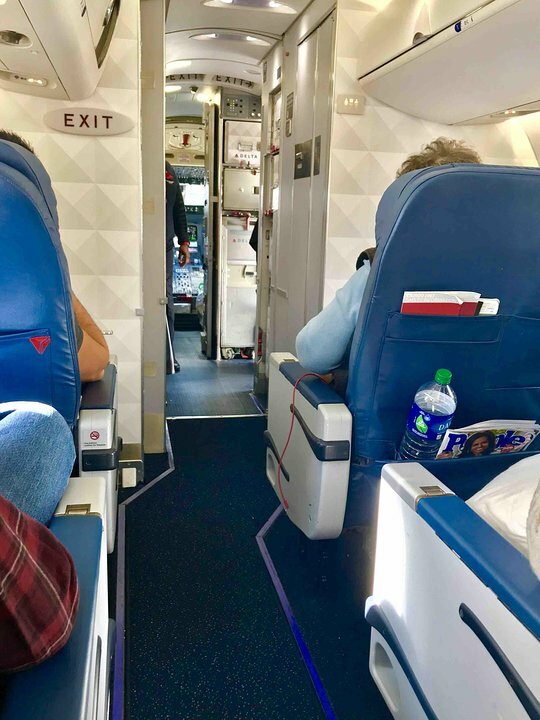 Its nit a horrible seat but unless a stick figure is sitting next to you, spring for a Delta Comfort or First Class seat on this specific aircraft. This seat represents a serious safety hazard for the occupant. Due to Skywest's effort to provide 1st Class seating, the aisle ends up coming straight in to 15B. This comfort seat's extra legroom exists in the aisle itself and forces the passenger to scrunch their legs back and to the side to allow traffic in the aisle. Further, turbulence could easily result in an in-use beverage cart to role into the passenger in the seat. The FAA should not have approved the configuration. Do not pay extra or be assigned this bad seat. Seat 9A was a great comfort+ seat. Sure, leg room may be tight, but it's a regional jet so there's no reason to think it would have extensive leg room. This seat had great head side window alignment. This flight was operated by N924XJ, an Endeavor Air CRJ900. No recline, but the person in front leans back into your lap. Incredibly stiff and uncomfortable, and the "head rest" pushes your neck forward at an excruciating angle. The foot space under the seat in front of your is interrupted by the seat support of row 2. It is enough room for your feet but not for any other baggage. Depending on both your carry-on, and your neighbor, you may be able to share a bit of the space to the right of the support. There was an outlet between the seats. Don't sit in row 18 if you can avoid it. You can smell the bathroom from this seat. Also the sounds of the engine make it very hard to hear and it makes your ears hurt. As for the seat nearest the aisle due to the small size of the plane people going and coming from the bathroom constantly bump into you which is very uncomfortable and annoying. Finally it takes at least 30 minutes to deplane as you are in the back of the plane. Don't sit in row 19 if you can avoid it. You can smell the bathroom from this seat. Also the sounds of the engine make it very hard to hear and it makes your ears hurt. As for the seats nearest the aisle due to the small size of the plane people going and coming from the bathroom constantly bump into you which is very uncomfortable and annoying. Finally it takes at least 30 minutes to deplane as you are in the back of the plane. If your Delta seat map shows Comfort+ from rows 5 thru 9, you are flying one of the rehabbed CRJ-900 (9E). Comfort+ has small cube under seat with power connections. Always pick this seat when available on Delta CRJ-900. Overhead storage on this side is very limited but I don't use it anyway. Not as nice as the Embraer E175. Great seat, window is not misaligned. Tons of leg space. Easily the most leg space on the plane, even more than in first class! Same for seat 5C. Note that Comfort Plus is now from rows 5-9 and you have a window at each row from rows 5-10. Only row 11 has no window, both sides. Seat 1A offers a bad window view, as the window is scratched by the jetbridge, thus only offering a very blurry view. Rows 9 and 10 both have aligned windows, older or newer CRJ900s. I was on N934XJ and N927XJ, seat 9A and 10A respectively, and the window alignment was great. On N319PQ and N304PQ, rows 9 and 10 also had great head-side window alignment. Truthfully, the only good alignment on Delta's CRJ900s are 4, 9, and 10. This was a Delta Comfort seat, in the second row of Delta Comfort. There was good leg room. I found this seat pretty "cushy"/comfy. I liked the raisable/bendable headrests as well. I am a bigger person and found the width somewhat better than other recent Delta flights - also, enough room to comfortably lower the tray table even when person in row 5 had reclined his seat a little. All in all, this was an improvement over the "non-Comfort" seats. In addition to no window, there is no recline due to the lav behind the seats. Affects 20C and 20D. Not sure about 20A and 20B. Had open doubles available in row 10 and 20. Attendant removed me from row 10, which was very comfortable (Comfort+) because they were premium seats so I went all the way back to row 20. To my unpleasant surprise, the seats do not recline and are marginally more comfortable if both seats are open but you're stuck in an extremely uncomfortable upright position. Misaligned window was not too bad. But seat padding was very uncomfortable. Flight less than two hours, but had to adjust position several times to ease pain. This seat actually had pretty good legroom for someone who is 1.73M tall.However, the seats were extremely uncomfortable The plane appeared extremely old and the tray table was gross. But it was ok for a 1-hour flight from YYZ to JFK. I would also like to note that seat 20A does have a window contrary to what this map says. The window for 8D is very slightly misaligned. You can easily see out of it, you just have to lean forward subtly. 8C and 8D were both comfortable - plenty of padding and support, adequate leg room, and the angle felt reclined even when fully upright. The seatback pockets in front of us were bigger and more usable than many regional jets, and there were electrical outlets. Roller bag fit in overhead compartment with minimal effort. The most conjusted seat & the most conjusted flight i have ever taken, no window & no recline made me feel like sit inside a carton box with no light n meager air , all sealed. Most claustrophic Seat on a plane & worst journey. Prefer Airbus 320 series or Boeing 737-800 far more than CRJ 900. There was a wait time of 30 mins for the flight to dock at the gate.I can't standup to go restroom as seat belt sign is on. Worst Journey ever. Allegedly a comfort seat (it says so on the ticket & the headrest) but very tight. Good legroom but not the width one expects from a business class seat. As others have commented, seat 5B has unlimited legroom but that is totally offset by no storage, a very narrow seat, and the fact that your legs will be in the aisle and bumped by every passenger and every flight attendant. It sucked. Nice premium eco seat, nothing in front so it offers unlimited legroom just need to be careful when the cart is coming down the aisle as it is very easy to get bumped. Because of asle offset there is nowhere for your legs and feet, if you stretch your legs out in front of you they are in the asle. I flew 4 CRJ versions on this trip -- the fourth was this one and it was noticeably more densely seated. 15D was cramped, tight, no leg room, and very uncomfortable. The worst seat on Delta CRJ900s. The allure of unlimited leg room seems great at first. But the aisle IS your leg room, anytime somebody walks by they are in your seat. No storage in the seat in front just adds to this cruel joke. If you get this seat and don't have much in the way of carry-ons, board last. During boarding having this seat is exceptionally painful. Seat 4A is my preferred seat on Delta's CRJ900. Other than the first row this is the only row in First Class with a properly aligned window. The added plus that you're in both the window and aisle and have storage under the seat in front makes it the best seat on the plane. 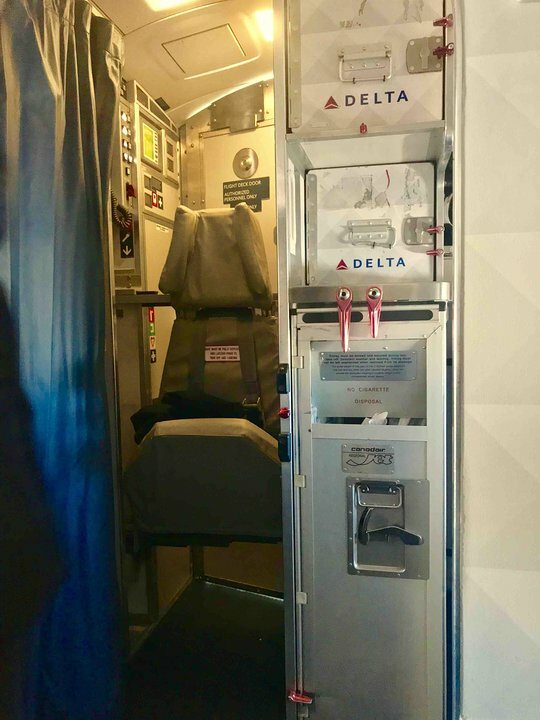 I would add that Delta (and the connection carriers) are refurbishing this model and that some of them now have power ports (USB and 110v) in some seats. They seem to be in all seats in First class, not sure about the rest of the cabin. Apparently there is a big difference between new and old CRJ900's. Our return flight was on an older CRJ90 and it was torturous. Our flight to NYC on the other hand was on a new CRJ900 and it was very comfortable. The seats were well padded and properly designed. Every seat seemed to have a power outlet with USB. All the difference in the world. Seat is too narrow, is poorly designed, and has insufficient padding. It appears that all standard seats are very uncomfortable. They are all similarly bad regardless of whether or not the seats recline or have aligned windows. This was the most uncomfortable airline seat I have had in many years. CRJ900 is a deal breaker. I will not knowingly fly on this plane again. Half the flight spent the flight either standing or clutching their backs upon landing. Delta should be ashamed of having this plane in its fleet. The seat, being an exit row, was comfortable. Bonus was that tray in armrest AND on seat back of row 12! I did not feel crowded and had ample space to cross my legs comfortably. I am six feet tall and I had an acceptable amount of leg room. Knees did not hit the seat in front of me with the seat pocket empty. However I am also wide and if there had been someone else in 9C it would have been a very tight squeeze. The corridor to enter the plane is too narrow, and the aisle in coach is impossible to move through without hitting everyone you pass. I somewhat agree on this seat you get a lot of legroom,but the seat doesnt recline and it is at a much straighter angle then a regular seat. So for me the extra legroom doesnt make up for how uncomfortable the seat pitch is. Old equipment. All roller boards must be checked. Incredibly small foreword head. Hard seats in first. Great legroom in row 1. Awful seat because of the inability of people to manuver from the first class aisle to the main cabin aisle. Hot with luggage, beverage cart and foot stomped by people walking to bathroom. Will never sit in this seat again! Added equipment for seat power severely restricts leg room. My back pack, which fits fine under a CRJ200, would not fit in the CRJ900. Be advised that new CRJ 900s and those that are being retrofitted with in seat power, will lose a majority of feet / luggage space under the seat in front of you. On the "A" side, the box sticks a god 4 to 5 inches into the underseat area, significantly reducing space for your feet or luggage. My small eBag which fit fine in CRJs without in seat power will now not fit due to the box. Delta typically operates this aircraft between ORD and SLC, a long route for a regional jet. Regardless, Delta somehow has managed to impress me every time with the combination of outstanding service and incredibly clean and new aircraft. Seat 2A does have a misaligned window as noted as well as having a somewhat flimsy pull out tray table, but it definitely is made up for with the service and cleanliness of the aircraft. If you have to fly on a regional jet, make sure to find this one and select any of the A row seats in First. The speaker for the PA system is overhead in between seats 7A and 8A, so it's rather loud. As a man who is 6'2" tall, the seating in the economy section is the pits. I always choose an aisle seat, but my legs did not fit in the allotted space. I could not stand straight up in the aisle as my head hit the ceiling, much less stand up in the bathroom! What gives with this airline company? You should be ashamed of making a profit on the working class. Seat 5B is an affront to decency. Only relent to that seat if they won't let you rope yourself to the top of the plane, or you're some kind of deranged self-flagellant. I had an early morning flight so I needed to get sleep, but that's impossible when your feet stick into the aisle despite your best efforts, and serve as a speed bump for the drink cart and every passenger who walks by. On top of that, the seats in the plane were incredibly uncomfortable, and seem to barely recline. Avoid 5B at all costs. First class is in a 1-2 config and on the 2 side aisle side is a support for the previous row which could limit your leg room. Misaligned window is unfortunate but incredible amounts of legroom. Legroom greater than any other Delta Comfort+ seat or domestic first class eat I've ever sat in. Did not notice narrower seat with at all. I'm not sure why this seat gets that much negativity from other passengers. First, despite being an exit seat, it does have a window and although it's a bit misaligned, one only needs to lean forward a little to use it, shouldn't be a big deal. The extra legroom is absolutely wonderful, I'm 6'2" and literally couldn't stretch enough to exhaust it. The overhead bin above the seat is reasonably sized. Finally, although the seat does not recline, its pitch is just right for a relatively short flight, not suitable for taking a nap, but definitely comfortable for such a small airplane. Overall experience is good, I'd have no problem going with this seat next time. I wish I had known about the lack of window, when I chose this seat. I didn't realize how important is was for me to be able to see outside, until I couldn't. When the fellow in front of me chose to have "his" window shade open, I could see a sliver of the outside. But when he closed it, I was left with nothing. The width is what you expect in economy on a small plane. And the overhead space was very shallow -- my usual laptop backpack couldn't fit in lengthwise. There is a substantial amount of leg room. The window is offset, but only slightly. The companion seat 5B is essentially in the aisle, and can be a problem during boarding; but a great row. I am a frequent work traveler yet found the engine noise was worse than bothersome; it was physically painful. I have rarely been so miserable throughout an entire flight. This is an Economy Comfort seat, but is much narrower than EC seats on other Delta planes, and the seatbelt is shorter too, by about 2 or 3 inches. Middle armrest wont go all the way up and out of your way, it will just stick out by your shoulder (or rest on top of your shoulder if you have a wide frame like i do. This is annoying when no one is sitting next to you because it makes it so you cant even take advantage of the extra space - even with no seatmate, you have to either remain wedged in between the narrow armrests or lift it up and let it rest on your shoulder. I did the latter which wasn't great but better than being wedged. Window is misaligned, it's far forward. Economy comfort seat. I'm 5'2" so this seat was fine for me but for someone taller, may be narrow. Lots of leg room! Short ceiling. Narrow storage area under seat in front. Misaligned from window. Better than 5B which projects into aisle and has no underseat storage. This has to be the worst seat on the plane. The window is misaligned, there's not enough room for any average sized person. Delta/Endeavor CR9 very worn interior. Seats 13C/D were great for legroom but seat cushion much worse than I remembered, basically sitting on tiny, hard plastic shelf for 3.5 hours. Awful. Individuals in this seat may get bumped by other passengers carrying their luggage on their shoulders. Best seat for recline as there is no bulkhead behind seat. Seat seemd narrower and a misaligened window is very annoying. Seats width is very cramped. Even in the Delta Comfort seat when two adult males are next to each other. We were both jockeying around as you almost need to lean outward and hunch shoulders so as not to bump each other. Leg room was ok. Cold. So very cold. I was in the exit row thinking oh joy, more legroom! I did get decent legroom, but the seats are so low my backpack would not fit under the seat in front of me properly. Then once we were in the air, the cold began. Cold from around the exit door. Cold on the floor. I had thick socks and boots on, and my feet were still cold. Upside, the overhead bins are large enough that my other carry-on fit in it. This is the first Canadair jet I have been on that I could do that. Seat tray table does not extend very far out from the seat, so if you are a portly person then you are squeezed into your seat in an uncomfortable position so that the tray table can be unfolded and you can have beverage and meal service. Also their is only one restroom and it is in the tail of the plane, so expect to try and squeeze past people in the narrow aisle. The seats near the restroom have people standing in the aisle so it's not very comfortable for them as well. Delta, you can do better. My window seat in coach was brutal. I'm 6'2" and could barely last an hour. The seats are extremely narrow and you are right up against the fuselage further cramping your space. These 'first class' seats are appallingly narrow; was in pain the whole trip. Speaking as a 5'7 guy, lots of legroom in the first row, even with there being a hard bulkhead in front of you. I could stick my leg straight out and barely touch the wall. Didn't have any issue with seat comfort as reported in some of the other comments. Also a pretty quiet seat with engines being so far behind you connected to the fuselage at the rear. Miles of legroom. As SeatGuru says, the window is misaligned forward, so you have to lean ahead a bit if you want to fully enjoy the view. Otherwise I think it's a great seat. 5B is a different story. Your legs go straight into the aisle, and you don't get any storage in front of you. If you're travelling with someone and you want legroom in economy, 5C and 5D are probably your best choice. Flew Economy Plus from GGT to ATL. Decent legroom, slightly wider seat. Window is not centered, but forward near the seat in front of you. Not sure how anyone survives in regular economy on this type aircraft, especially if you are over 5' 8" or someone reclines in front of you. I have wide hips. 12a (which someone else said doesnt have arm rests on window side) Does indeed have one of the wide (tray in armrest width) 1/2 armrests in addition to being narrow traystyle on the other side too. One of the worst seats ever. "First Class" seat on a regional jet. I didn't find the window misaligned. Had nice leg room and room under the seat for my bookbag. Overhead bin had sliding doors for small purse/jacket type items. Terrible seat. Has extra leg room due to being exit row, but no window. The exit door also takes up left elbow space. Seats don't recline, but seat back is at almost 90 degree angle from seat cushion, almost pushing you off the seat with no seatbelt on. I am a flight attendant on these aircraft. When it's humid outside condensation drips onto the passenger who is sitting in 17D. Horrible seat, no window, doesn't recline, and the seat in front of you is like 8 inches from your face. Seat was comfortable and had plenty of legroom even though it is a bulkhead seat. Worst seat ever on a plane! No recline, my knees touched the seat in front. Person in front reclined his seat! Ugh! For a bulkhead seat, this one has quite a bit of leg room. You could do worse than this seat for first class. Seats are definitely a cramped feeling, the seat is actually between 2 windows which if you like looking out like I do it makes it a little hard to do. Also I think more than 1 and a half hours in this plane is plenty any longer and I would say good luck. Old, old plane. No power. Bathroom smell was awful. Crew lovely. intermittent wifi, couldn't stream movies. Theses seats are made of cardboard and not comfort in first class or comfort economy, no leg room and width of seats are super tight for the class. I would not pay for seats anymore in the location, just not worth it. I flew on two flights on this model plane in first class, and found it to be one of the most uncomfortable experiences I have ever had in first. The seat bottom is *very* firm, like a stadium seat. Seat width is good, but the seatback is reclined steeply even in its most upright position. My seatmate and I commented that we've never taken off feeling like we were laying down. I was initially happy to see that I was upgraded, but honestly I would rather have had a coach seat on these airplanes. I sat in 5A today, and paid $35 to do so on my flight from MKE to LGA. The legroom was amazing, as I am 6'7". I also agree the windows are misaligned. Not a big deal. However, what was a big deal is the shoulder space for this seat. I had zero room for my left shoulder. Thankfully, noone was in 5B, otherwise this could have been a big issue. 5B as indicated, doesn't have a seat in front of it, so no storage for that seat. I would avoid 5A & 5B. All other Economy Comfort seats on this planes appeared to be good. Not sure how much shoulder room is available for any window seats behind this one. Got switched to the exit row, and regretted it. This seat has very little padding, and seems to have a short seat area, my legs were not supported. It did have extra leg room but my seatmate spent the entire flight leaned over with his head in his hands. Window is way off from easy visibility. Awesome legroom, economy comfort immediately behind First Class. One of the worst exit row seats i ve experienced. Leg room good but no recline which i can live with but seat is very hard, narrow, extremely short back to front and tilted forward so you feel like you,re leaning forward. I flew in seat 20D. I was supposed to have seat 11A but they switched me for some reason. No window, no recline. I slept on a tray table and woke up to "no more cookies, crackers, or peanuts." Inhumane for a two hour flight. I am 6'4" tall, so obviously a smaller plane allows for less head room when walking though, but no big deal. Tall people live their lives ducking low ceilings. I agree that the seat cushions were a bit uncomfortable, but we had a 3 hour flight and I was able to tolerate it. Overall a very nice plane (just small) and a pleasant flight. I would book a flight on this plane again if need be. row 12 - seats were like torture! I knew there was no recline, but the pitch of the seat pushed you forward. Was a very painful 3 hours even with a back pillow and no prior back problems. This seat has great leg room, but the seat cushion is EXTREMELY HARD. You will have a sore rear after sitting in it for even just an hour. Very Easy to get on and off the airplane. It was loaded with legroom although your the last person to get snacks.It was a great flight because of that seat and that seat only. Not only do you get bumped by the drink cart in 5B, but if you put your legs down in a normal sitting position, you are in the aisle. Forget stretching your legs out, because then you are really blocking the aisle, so there goes the extra leg room. I put my feet as far back as possible without going under the seat and they were still in the designated aisle. Horrible. Not only do you only have the one seat back to store things in, but it is really out of reach for those sitting in 5B. A terrible seat. The seats are narrower than mainline jets but it's still the nicest RJ. Large bags will be gate checked, so there is room in the overheads for smaller bags and coat. First class is kind of a joke on such a small plane. Row 9 is fine for a 2 hr flight. Seats behind the exit row is significantly noisier than the front. Loads of legroom in exit row 13. However, seat bottom length is noticeably shorter than the standard Economy seats. This results in the feeling of always "sliding down" the seat. Very uncomfortable for the DTW to AUS flight of 2hr 45min. Not too bad, this plane is more spacious than the crj200, I didn't feel as cramped. The worst part is being in the back of the plane and it takes forever to deplane. The smell and traffic to/from the restroom are unbearable in this seat. 5A and 5B share a single seat back pocket due to the single first class seat in front. This can be inconvenient for storing personal items. Seat 13D is little more than a jumpseat (much smaller depth, IN ADDITION to "smaller width" as stated) with no armrest on the window side. Very uncomfortable. Delta flies 1 versions of CRJ 900 Vers. 3.